Web Application development can be complex and intimidating. It can also be very expensive if you get it wrong. 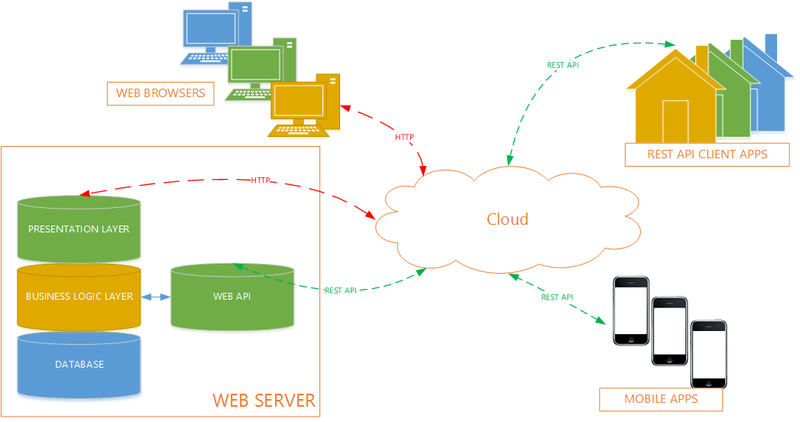 The diagram shows how your Registered Training Organisation (RTO) and your clients can access a good web application that delivers an outstanding user experience on a desk top, in a web browser, or as a mobile app. We use robust API client applications. What the diagram doesn’t show is secure authentication, fire-wall protection and a host of RTO Software challenges that we have to consider everyday while making sure Bluegem is delivered reliably and securely with optimal performance. Bluegem is a complete web-based .NET solution that will ensure you can go about your business every day as a training provider, safe in the knowledge that your technical foundation is secure and rock solid. Bluegem is flexible and infinitely scalable to adapt to the compliance reporting and operational needs of your business with as little as a months notice, the entire Learning management System platform and your data can be hosted in a region of your choice, assuring you of good data sovereignty, and that your data is hosted where you need it. As a Microsoft Gold Applications Development Partner of 11 years, you can be sure that Bluegem uses the best and most reliable technologies to deliver your RTO Software and training management solutions.